Today’s Daily Prompt is the word “Bottle.” For me the word conjures up different images. From wing chimes to TV shows to beer. First, the TV shows. One of the best intros to a TV show involves a bottle. The show “I Dream Of Jeanie.” LINK. 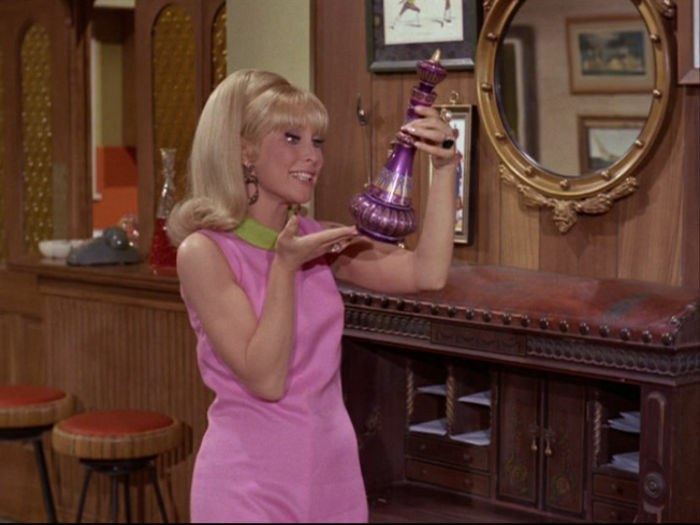 Jeannie’s animated bottle is a unique as the one used on the show. It was perfectly designed to look mysterious, yet unnoticed on a book shelf. Hell, even the space capsule in the intro looked like a bottle. Wind chimes. Since I bought the house a year ago, I wanted to add on a screen room. I have a few estimates but haven’t pulled the trigger on it yet. No reason why, I have the money and the expense isn’t all that great to bare. One of the things I want to decorate with would be a wine bottle wind chime. They look easy enough to make, thanks to Pinterest. I would make two really, one with wine bottles and a second with tiny liquor bottles. Just to get two different sounds. BEER! Well if you read my posts and follow me on social media at all, you know that I like beer. I host a beer review show called “Day Drinking” and I enjoy every second of it. When I was a lad and didn’t know much about what good beer was, I would often drink a beer that had a unique bottle. I won’t name the beer but it is still sold and tastes awful to me. The bottle had a flip top so that you could reseal the bottle and finish your beer later. Today, this bottle still appeals to me, mainly because I would want to use the empty bottle to make spicy olive oil in or an onion based hot sauce. But I digress. Bottles can capture our imagination, given the chance, from collection beach sand, to recalling a night with a loved one when you see the empty bottle of champagne on the shelf. Perfume and after shave bottles can evoke the memories of our grandparents. It can serve as the ultimate time capsule.